ASSETS client and winner of the third annual Great Social Enterprise Pitch, Melanin Essentials, are making news! 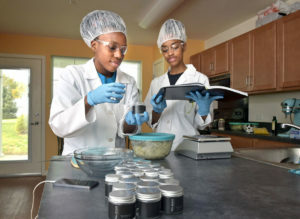 Melanin Essentials cofounder Olayinka Credle (L) and Saba Adana Williams are shown testing the products they will be selling. A few weeks ago, New York native Olayinka Credle and her longtime friend Saba Adana won Lancaster’s third annual Great Social Enterprise Pitch. Now the 24-year-old Willow Street resident is doing final testing for Melanin Essentials, the business they plan to launch on Nov. 25 selling chemical-free beauty products for women of color. Their business model is designed to employ single mothers at $15 an hour. Family: Husband Milan Credle, a teacher’s assistant and musician, daughters Jade and Joelle. Education: Bachelor’s degree from Millersville University in sociology with a minor in government and political affairs, and I’m pursuing a master’s degree in public policy from Liberty University online. Job history: I worked as a payroll administrative assistant in my undergrad years until I was appointed to be the student trustee at Millersville by Gov. (Tom) Corbett, and I did that until I graduated. Then I moved to Washington, D.C., right after graduation in May of 2014 to work for Congressman Mike Doyle of Pittsburgh. I got married in December 2014 and moved back to Lancaster in March of 2015, which is when my co-founder and I started working on the planning and development for our business. Business partner: We met 10 years ago and have been best friends ever since. We met freshman year of high school. That was at Sci Tech, a cyber charter school in Harrisburg. We instantly clicked and became best friends. Since then, we graduated from the same high school, graduated from the same college and married our husbands, who are also best friends. Unfulfilled ambition: I want to end up back in politics, probably in the second half of my adult career. Right now I’m starting a business with a goal of using it and growing it to help the community. Eventually I want to get to the point where I’m not the manager of the business, I just own it. My goal is to end up in Congress. Pivotal decision: Getting to know and love Jesus and surrendering my life to him, freshman year of September 2010, my first year of college. My life has never been the same since then. People would be surprised that: I write: blogging, short stories, songs, poetry. If I had to keep one skill for the rest of my life — politics, business, anything — it would be writing. It’s a sense of peace and joy for me. One thing I’d change about myself: I’m always late or just on time. I watch: Anything Marvel; my husband has me addicted to shows like “The Flash,” “Arrow,” “Legends of Tomorrow,” “Luke Cage.” And I love documentaries.